Former world number one Novak Djokovic says overcoming the mental challenge will be Andy Murray's biggest obstacle when he returns to tennis after a long-term hip injury. 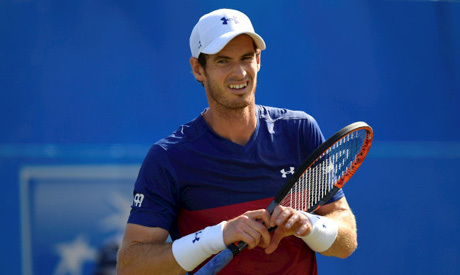 Murray, who has been sidelined for almost a year since losing in the quarter-finals at Wimbledon last July, will face Australia's Nick Kyrgios in the first round at the Queen's Club tournament on Tuesday. "... I think the biggest challenge will always be mental," Djokovic, who is trying to recapture top form after undergoing elbow surgery earlier this year, told British media. "How to get it out of your head, understand that it's behind you, that you're fine now, that you're healthy and you can focus on your game rather than thinking 50 percent of the time about whether or not something can happen." The 12-time Grand Slam champion also said grass might not be the ideal surface for Murray to make his return. “I don’t know the state of his hips,” said Djokovic. “But the one thing that could be a bit dangerous is slipping on the grass. That’s something that is very unpredictable and grass is always this kind of surface where one wrong footing can make something go wrong, especially in the hips."